The present Ph.D. thesis consists of a literature review and three research papers below, which are referred to in the text by Roman numerals. The studies have been accomplished at Experimental and Clinical Orofacial Pain Laboratory, Center for Sensory-Motor Interaction (SMI), Department of Health Science and Technology, Faculty of Medicine, Aalborg University, Denmark, in the period from 2009 to 2011. 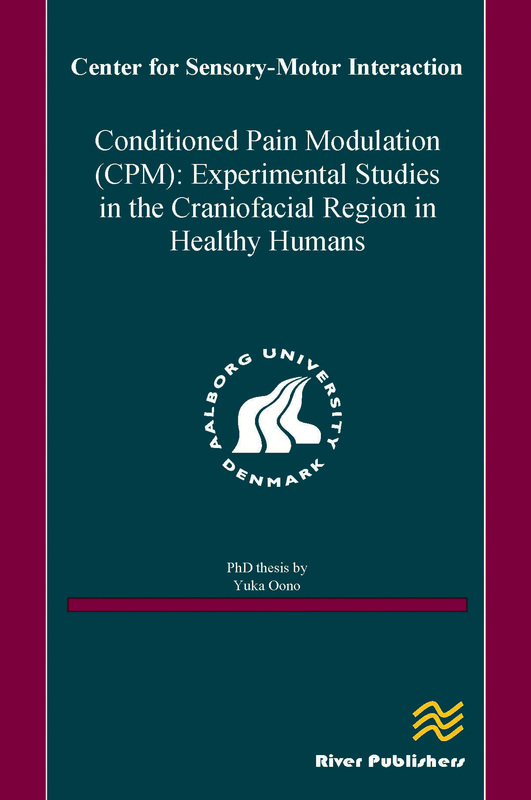 I. Oono Y, Wang K, Svensson P, Arendt-Nielsen L. Conditioned pain modulation evoked by different intensities of mechanical stimuli applied to the craniofacial region in healthy men and women. Journal of Orofacial Pain 2011;25:364-375. II. Oono Y, Wang K, Svensson P, Arendt-Nielsen L. Conditioned pain modulation evoked by a mechanical craniofacial stimulus is not influenced by nociceptive stimulation of the temporomandibular joint. Journal of Orofacial Pain (accepted for publication, 2011). III. Oono Y, Nie H, Matos RL, Wang K, Arendt-Nielsen L. The inter- and intraindividual variance in descending pain modulation evoked by different conditioning stimuli in healthy men. Scandinavian Journal of Pain 2011;2:162-169.